"When a war ends it does not go away," my mother says. "It hides inside us . . . Just forget!" But I do not want to do what Mother says . . . I want to remember. In this groundbreaking memoir set in Ramallah during the aftermath of the 1967 Six-Day War, Ibtisam Barakat captures what it is like to be a child whose world is shattered by war. With candor and courage, she stitches together memories of her childhood: fear and confusion as bombs explode near her home and she is separated from her family; the harshness of life in the Middle East as a Palestinian refugee; her unexpected joy when she discovers Alef, the first letter of the Arabic alphabet. This is the beginning of her passionate connection to words, and as language becomes her refuge, allowing her to piece together the fragments of her world, it becomes her true home. 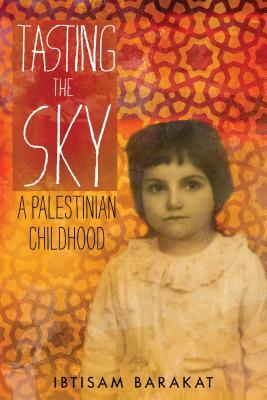 Transcending the particulars of politics, Tasting the Sky: A Palestinian Childhood is an illuminating and timely book that provides a telling glimpse into a part of the Middle East that has become an increasingly important part of the puzzle of world peace. A bilingual speaker of Arabic and English, Ibtisam Barakat grew up in Ramallah, West Bank, and now lives in the United States. Her work focuses on healing social injustices and the hurts of wars, especially those involving young people. Ibtisam emphasizes that conflicts are more likely to be resolved with creativity, kindness, and inclusion rather than with force, violence, and exclusion. Her educational programs include Growing Up Palestinian; Healing the Hurts of War; The ABCs of Understanding Islam; Arab Culture, The Mideast Conflict; and Building Peace. The ABCs was selected by the Missouri Humanities Council as one of its Speaker Bureau programs in 2003 and 2004. Ibtisam has taught language ethics courses -- Language Uses and Abuses -- at Stephens College (2002). She is also the founder of Write Your Life (WYL) seminars and has led WYL seminars in places including Morocco, Washington, D.C., Missouri, and Ramallah. In 2001, Ibtisam was a delegate to the third United Nations conference on the elimination of racism, which was held in Durban, South Africa. In 2004, she was a visiting writer at the Creativity for Peace camp, which brought Israeli and Palestinian teenage girls to Santa Fe to provide an opportunity for them to live together in cooperation and peace. In January 2005, she was a moderator at the fourth international Faculty for Israeli-Palestinian Peace conference in Jerusalem, where Israeli, Palestinian, and international faculty members and students work toward finding creative ways to bring about peace for Israel and Palestine. As an educator, poet, and peace activist, Ibtisam has spoken at the Center for Southern Literature / Margaret Mitchell House and Museum; William Woods College; Missouri Historic Theater; Dartmouth College; Printers Row Book Fair in Chicago; PEN New England; National Writers Union / New Jersey chapter; the International Children’s Literature Day / University of Wisconsin; Children’s Literature New England / Williams College; North Carolina Center for Advancement of Teaching; Reading the World / University of San Francisco; and various high schools, including the school district of Anchorage, Alaska. Ibtisam Barakat lives in Columbia, Missouri. TASTING THE SKY is her first book.